1958 — Lebanon was yet again at the forefront of foreign policy concerns. Gamal Abdel Nasser, one of the most prominent politicians of the postwar world, was powerful not only in Egypt, but also in much of the Arab World. Known for his Arab nationalism and sharp criticism of Western power, his influence reached many throughout the Middle East. In the wake of the 1956 Suez Crisis, the Christian leader of Lebanon, President Chamille Chamoun, was sharply criticized by Nasser and Lebanese Muslims for maintaining diplomatic ties with the involved Western powers. Tensions escalated with the creation of the United Arab Republic, a union between Egypt and Syria and led by Nasser, as Chamoun refused to join despite pressure from Lebanese Muslims. Mindful of the recent overthrow of the pro-Western king of Iraq and threatened by civil war, Chamoun asked for help. President Eisenhower authorized Operation Blue Bat on July 15, 1958. 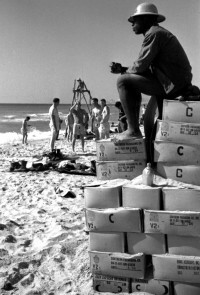 U.S. troops landed on the beaches of Beirut and remained in the city until October. In these excerpts from ADST’s oral history collection, two officers provide their perspectives on the events surrounding the Marine landing in 1958, including how Ambassador McClintock retaliated when Marines were seized, helping missionaries who didn’t need it, and the surreal sight of troops being met by children selling Cokes. Walter Silva served as American Citizen’s Affairs Officer in Beirut from 1957 to 1960; Holsey Handyside entered the Foreign Service in 1955 and served in Beirut from 1957 to 1959. They were both interviewed by Charles Stuart Kennedy, in 1995, and 1993. SILVA: In 1958 we had the evacuation. The Marines landed on a beach crowded with astounded bikini-clad Beirutis. That was exciting. Lots happened…. What we saw happen in Lebanon was a reflection of what Egypt’s Nasser had inspired in the area. In effect Syria intervened very directly in what appeared to be an internal civil altercation in Lebanon. Muslim Lebanese were determined to overthrow the system of confessional government that had been established during the French Mandate. The system was established on the premise that the majority of the population was Christian – based on a census which the Muslims asserted was not accurate. The government was to reflect the population. The Prime Minister was a Maronite Christian, the Deputy Prime Minister would be a Greek Orthodox or whatever, and each cabinet position was designated by religion. So the Muslims found the moment in 1958 to try to redress the balance, so to speak. The Syrians, of course, came to their aid. There was some shooting going on, bombings, etc. 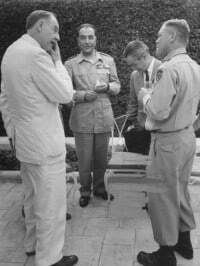 The Nasser connection was there, it was obvious, so was the connection with the King of Iraq. But it seemed distant. The real problem was the confessional problem. The Marines landed, they took control of the airport and moved into town. It was always maintained, erroneously of course, that it was bloodless. At least some Marines were killed at the airport, by snipers. There was never a confrontation between the Marines and whoever it was, but at night time, when the Marines were patrolling the perimeter of the airport, they were killed. Thirty or so were killed, I was told. There were some real moments. The ambassador at the time was Robert McClintock, a tough eccentric character, but marvelous in many ways. When they evacuated the embassy most of the wives, my wife included, went to Rome. And they kept a skeleton embassy, so to speak. I stayed, though I was among the lowest ranking officers of the embassy…. During that time a couple of interesting things happened. The Marines patrolled the downtown area around the outside of the Basta which then was the Muslim neighborhood of Beirut…The Marines would patrol in a jeep armed with a 50-caliber machine gun every day. Once, in broad daylight, armed men came out of the Basta and captured the jeep, Marines, and weapons and took them into their neighborhood. Enough people saw it happen that it was reported to the embassy and the task force commander immediately. The commander of the task force was Admiral [Charles R.] “Cat” Brown; he was, I think, then head of the Sixth Fleet. There was a hasty staff meeting called at the embassy. The Admiral hemmed and hawed and wasn’t certain what to do: Ambassador said he knew exactly what to do. He asked for a tank. As it was related to me, he went with the tank and a public address system and parked it in front of the Basta gate. The tank’s 90-mm gun was pointed into the Basta and the interpreter on the loudspeaker announced that the gun would begin firing in three minutes if the Marines, the jeep, and weapons were not returned immediately. Then we learned that in the town of Tripoli…a group of American missionaries wanted to leave and were not able to. They did get a radio message to the embassy…they said they were in danger of their lives and needed help to get out. McClintock held a staff meeting. As I recall, the Political Counselor said there were Muslim roadblocks along the highway so that a rescue by convoy would be dangerous. An armed military convoy was suggested. It was turned down. We could not risk an armed confrontation with the peasant militias and face the resulting bad press (this was the same ambassador who had threatened an entire neighborhood with a tank!). I went to my office and scanned the consular regulations and the Code of Federal Regulations and found nothing to help me. So I went down to the port anyway. There were two vessels in port, there was one huge freighter, an enormous thing, and there was a seismic research vessel that belonged to a Mobile, Alabama company. It was a magnificent thing, 150-feet long, modern, and it had millions of dollars worth of equipment on board for seismic research. They were on their way to the Gulf. The crew was made up of men from the Mobile area and Louisiana. Their English was nearly a foreign language. He was scared to death – the boat was a huge responsibility and he was going to sail up an unknown coast studded with submerged rocks and outcroppings of all kinds. But at that point he seemed to see the venture as an adventure and became almost enthusiastic. We left a little before sunset. I forget how long it took, but it was several hours. We got to Tripoli in the moonlight with only the outline of the city ahead. The captain said, “Now, I don’t know how to get into that dock. I don’t know where the channel is. And I’ve got $5 million worth of boat here.” As we neared the port, with our own lights blazing, we started getting blinking lights from the pier, automobile headlights obviously. The captain dropped the anchor. I got into a dinghy with one of the crew and we putt-putted to the pier. There we found a small group of missionaries, about a dozen altogether, with half a dozen cars flicking headlights off and on. “We want to go back with you,” one said, “but most of the people are taking the road to Beirut.” So, we took them on board, their luggage, dogs and cats, and had a pleasant, incident free daylight sail back to Beirut. It was mid-morning when we got back, and there at the pier was Ambassador McClintock with the press, Time Magazine, Newsweek, the Washington Post, the New York Times, you name it, all the press waited with their cameras to record the arrival. Ambassador McClintock and the missionaries with the boat in the background. As a matter of fact, he did make Newsweek magazine with the story about the besieged missionaries who were saved with a bold stroke. Of course, at the same time, the rest of the missionaries had arrived by road. When they finally got there and came into the consulate I asked if they had had any trouble. They asserted they had none. There were roadblocks, but the people were very friendly and waved them through. But I had had an exciting boat trip, risked a several million dollar boat that I had taken over with no legal ground to stand on. It was that kind of post. Never dull…. Many, I think, in the embassy thought [the invasion] was stupid and unnecessary. And the fact that it took place with such apparent ease made it look ridiculous. Threading their way through bikini-clad sunbathers and that sort of thing. It was held up to ridicule by the American press. And it was held up to ridicule there. Necessary for what? It was sold partly on the basis that we needed this force to permit the evacuation of Americans – that was absolutely ridiculous. You could have driven south with no danger into Israel, the airport was never closed, there were sea lanes wide open, lots of ships around. There would be no problem. HANDYSIDE: McClintock was unhappy because he thought that this [invasion] was recognition and admission of failure, certainly failure by the diplomats, but also because he had been told by the Christian head of the Lebanese military forces that if these foreign troops were introduced into the country, the Lebanese armed forces would have no choice but to oppose them in military fashion. So one of the things that the Ambassador did in order to make sure that this didn’t happen, he somehow got General Chehab, who was chief of the armed forces, into the American Ambassador’s limousine and together they drove out along the airport where the Marines were coming in across the beach and where the Airborne troopers were landing. (The Airborne troops were all disappointed they couldn’t drop in; they landed on the runways and off-loaded the airplanes with their parachutes still on their backs.) As the American military forces got enough equipment ashore and were ready to start moving in from the airport area north along the coastline to the city of Beirut, the military column was led into the city by the American Ambassador in his limousine accompanied by the chief of staff of the Lebanese military. HANDYSIDE: One poodle. This was the way McClintock maneuvered this potentially explosive situation to make sure there wouldn’t in fact be any shooting. Whatever the attitude of the men in the Lebanese military might have been about the arrival of these foreign military personnel, at least it wasn’t going to disintegrate into a kind of foolish competition…. As the Marines came across the beach there was a whole bunch of little Lebanese kids who had Coca-Colas to sell. 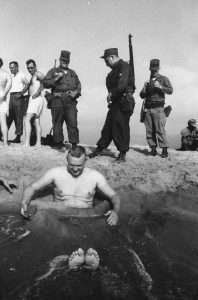 They greeted the Marines as they waded ashore with, “Hey Jack, you want a Coke?” And that was the spirit that sort of characterized the rest of it for the rest of the summer. The troops arrived around the 15th or 16th of July and stayed until the first week of October. There were some problems, but the populace understood that the American soldiers and marines didn’t really want to be there, and they sure as hell were going to go back home. The Beirutis seem to have concluded that the U.S. troops were there to help them keep order in their house after they had demonstrated, left by themselves, they couldn’t do that.